The problem of toys scattered all around your home does not have a one-size-fits-all solution. Ultimately, your choice of toy storage for kids’ rooms will be determined by your child’s playing style and, perhaps, by your temperament. Some of us are still kids at heart and love toys as much as our children do and may want to put them on display. For others, maintaining a tidy and de-cluttered interior is the goal. Whatever you and you child prefer, here are our top toy storage ideas. Children and tidy living spaces tend not to mix, period. But there are still options to restore order, if only for a short while. One is to store children’s toys in a hefty box or chest, like the impressive Westcote Blue Toy Box from Cotswold Co. The equally solid-looking Personalised Toy Box by Chatsworth Cabinets (pictured below) would make a stylish addition to any living room or bedroom. Personalised toy storage is another, and perhaps more effective way to create a routine around putting toys away. Many kids will relish the responsibility for putting away their own toys, especially when that involves an attractive container or bag with their name on it. We particularly like that very cute Pennant Flag Nursery Basket from Clouds and Current, and the handy Personalised 'Important Toys' Storage Crate on wheels from The Room Alive (below). Both are available from Not on the High Street. And for kids who like crafts or Lego, there are plenty of organiser solutions, such as the mesh drawer systems from Elfa. Crucially, all of their drawers are see-through, allowing your child to find what they want quickly and without pulling everything else out along the way. If you are after Lego specific storage, check out our guide. For some parents, the best solution may well involve giving up, at least to an extent, on putting their children’s toys away. It may be that a child has favourites she or he just cannot part with for very long, or the sight of your child’s toys actually gives you joy. The elegant String System in White allows for a compromise between having toys on display, and putting them away. Also available in grey, all from Skandium, from £72. 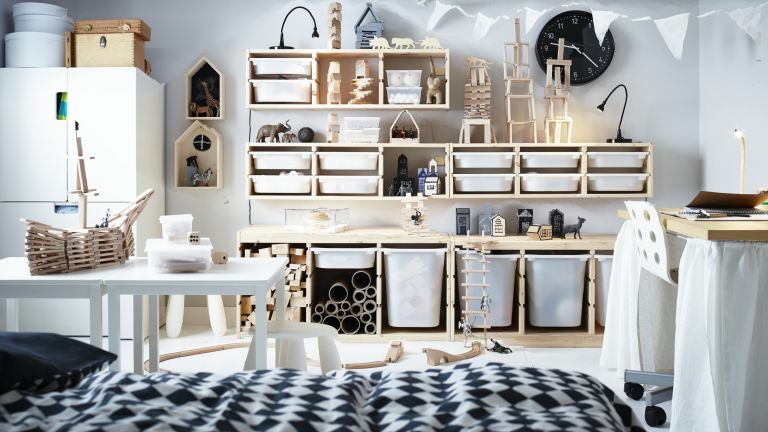 Shelving does not have to be boring, so why not integrate shelved toy storage into the design of your child’s bedroom? The very pretty shelves from minifili (above) create a quirky display of your child’s toys and allow you to put them away out of reach after playtime. And the Elfa Tots Wardrobe offers a comprehensive storage solution to everything from toys to clothes. If you are feeling creative, you can also make shelves by repurposing anything from planters to paper tubes. For example, follow this guide for making toy shelves on the quirky Swedish blog Pysselbolaget (below). Knitted toy hammocks can be attached to walls and doors and are handy for that abundance of soft toys that builds up. Buy one ready made from Etsy, or download a knitting pattern and make one like the sweet design pictured below yourself! For kids who like to play outdoors... then indoors... then outdoors again, a wagon is a flexible option that can also be used for toy storage once playtime is over. This toy wagon by Plan Toy is so striking, it is guaranteed to captivate the little one’s attention. Available at Kidly.co.uk. If floor space is so tight it's a choice between toy storage furniture and toys, why not seek a compromise? A play teepee will transport your child into another world, and when they're back to earth, they can stash away their toys in it. There are options for every budget, from the very affordable, such as the Wigwam Play Tent from Big Game Hunters to pure luxury, such as this stylish option from Wildfire Teepees (pictured below). Many of us are trying to make more sustainable choices when we shop for homeware – why shouldn’t that apply to toy storage, too? These adorable animal face Tellkiddo Drawstring Bags (below) are made sustainably from cotton and will add a touch of Scandinavian cool to any room. There is a paper version as well. If you want to hit the next level in children’s room tidiness, consider investing in furniture with built-in storage. You can start small, with an inconspicuous ottoman that can sit easily next to any piece of furniture. Or, for under-used under-bed space, opt for under-bed storage crates. Or, go straight in at the deep end with a comprehensive toy storage solution such as The Dormy House Modular Wall Storage or Multi Modular Storage (pictured below), which is customisable to your space, storage needs and even colour scheme. Children's storage and playing needs go through so many transformations over their early years, it can be exhausting (and expensive) to keep replacing and rearranging their toy storage. Help is at hand with Ikea's clever Trofast storage combination. It comes with removable plastic trays, can be added to and rearranged, and can be used as a shelving unit for everything from books to games consoles when your child is older. Children’s books can be particularly difficult to organise - they slide easily behind sofas and fall behind bookcases. Smaller units, which can sit handily by their bedside, are easier for children to use. We like this cute Elephant Book Stand from JoJo Maman Bebe (below). If the idea is to make it as easy as possible for the little person to put their books away, the Sling Bookcase from GLTC is very easy to use, with the books simply sliding in between its compartments. Portable caddies can work much better than heavy boxes and bins if your child likes to play in multiple rooms; they can also useful for bringing toys outside. We like the Elfa Stacking Open Toy Storage Trunk, which is easily buildable into a unit, or can be carried around on its own. Make learning more fun for the kids by combining toy storage with a desk, or position a blackboard above your toy storage unit. Taking breaks for playtime is much easier when the toys are within easy reach. Take inspiration from the Industrial Kids Storage Bench by Woood, which can be conveniently positioned right underneath a blackboard, transforming study time into interactive play time. Does your child like to take ALL their favourites to bed? Then they need a bedside pocket organiser. Noa and Nani have this cute Pockets Bed Organiser for aspiring pirates.